Latest Fixed deposit rates – Fixed deposit is safe investment option which provides fixed rate or return. Fixed deposit rates vary according to amount, tenure and bank. There are various banks offering fixed deposit investment. The key of maximizing return is to select best fixed deposit scheme. So which banks pays the highest rate of interest on the fixed deposit? 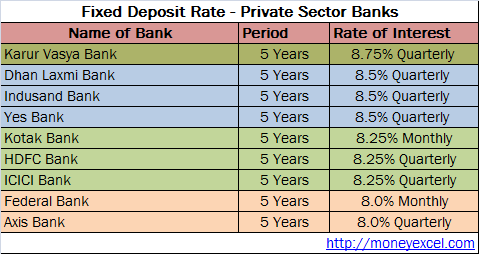 Let’s take a closer look at latest fixed deposit rates offered by banks in India 2015. Above latest fixed deposit rates are for a Non-Senior citizen, most of the banks offer 0.5% – 1% extra to senior citizens. Above fixed deposit, the chart gives the idea that which banks are offering the highest rate of interest. However please note that these banks may not be offering the best rate of interest for all period and amount. In order to help you, I am herewith few tips for fixed deposit investment. You should invest your surplus money in fixed deposit. Ideally you should select the longer duration of fixed deposit because the bank offers higher returns for longer duration. If you are selecting fixed deposit for longer duration please make sure that you are not in need of this money in nearer future. If you feel that rate of interest is likely to go up in future, you should select fixed deposit with shorter duration. Whenever interest rate goes up, you can re-invest the money and earn a higher return. If you are planning to invest larger sum, say 1 Lakh or above it is advisable to have more than one fixed deposit in a different bank or in the same bank. In case of emergency, you can break any one fixed deposit and use that money. If you are not good at keeping records for the maturity of fixed deposit, you should select fixed deposit with the auto renewal facility. If you are keeping a large sum of money in the account and want to have liquidity all the time, an auto sweep is a facility that you can use. Auto sweep facility provides dual benefits fixed deposit also and liquidity also. In case of your fixed deposit earning interest in a year is less than Rs.10, 000 and you don’t want TDS to be deducted, you should submit form 15 G or 15 H at the bank. If you want to save tax you can invest in the tax saving deposit. Amount invested under tax saving fixed deposit can be claimed for tax exemption under section 80 C. Tax saving deposit has fixed the 5-year lock in period. 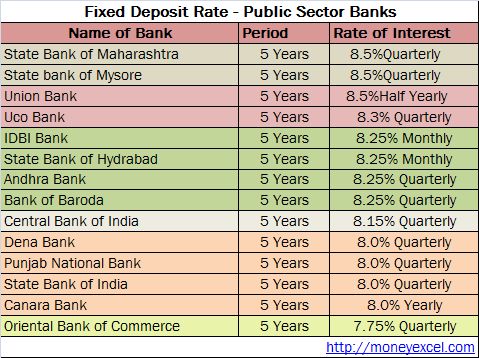 Feedback and comments about this comparison of fixed deposit rates are most welcome! Thanks for this useful tips on Fixed deposits.